"I would be willing to 'shut down' government if the Democrats do not give us the votes for Border Security, which includes the Wall! Must get rid of Lottery, Catch & Release etc. and finally go to system of Immigration based on MERIT! We need great people coming into our Country!" Mr Trump said on Twitter. A disruption in federal government operations in the months before November congressional elections could backfire on Mr Trump if voters blame Republicans, who control Congress, for the interruption in services. 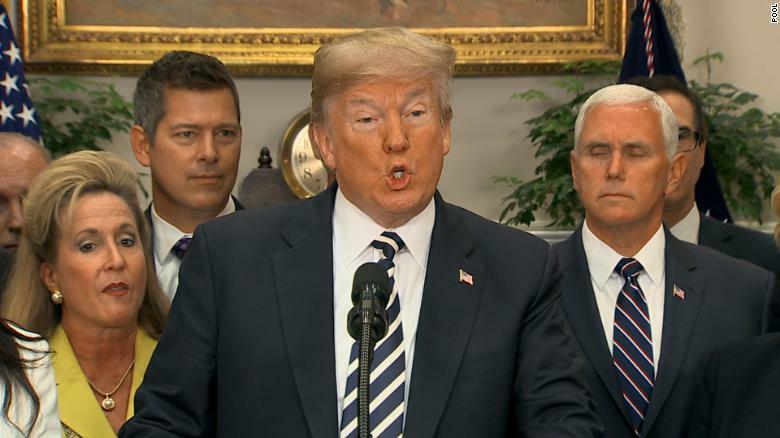 Mr Trump wants Congress to pass legislation that addresses immigration issues, including the border wall, changing the way visas are allotted and other immigration restrictions. The Republican President has made tougher immigration laws a centrepiece of his administration, from the first ill-fated travel ban on people from predominantly Muslim nations to the current battle raging over the separation of illegal immigrant children from their parents at the US-Mexico border. Mr Trump has requested US$25 billion to build the border wall and US$1.6 billion has already appropriated for the project. US House of Representatives Speaker Paul Ryan said lawmakers were considering an appropriations measure seeking an additional US$5 billion for the wall. Lawmakers met with Mr Trump last week to discuss the appropriations process to fund the government by the September deadline. "We really just want to get the military funded, on time, on budget on schedule this year. And that's the primary concern," Mr Ryan said Wednesday on Fox News.